Goalie Wars is a game with two goals placed within close proximity of each other and an amount of time on the clock. The winners will have scored past the opposing goalkeepers more times than they conceded! As a thank you to parents who weekly drop their children off to JUST4KEEPERS goalkeeper training in Bray & Wicklow, Darren Quigley is hosting Wicklow’s first Goalie Wars competion. 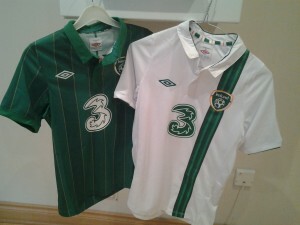 It will be a two man team event with the winners going home, just in time, in their new Ireland European Championship jersey for 2012! The referee will have to be sure and sharp! There’ll be tears I’m sure but there can only be one winning team. Good Luck!